Home Scandal and Gossip Shia LaBeouf reluctantly checks into rehab cause he knew he had to. Shia LaBeouf wants to redeem himself or does he? The rebel Hollywood actor/buffoon may have had his hand forced after last week’s Cabaret meltdown fiasco which saw the ballyhooed actor making a scene in and out of the theater over the course of the afternoon. His adventures that day included getting annihilated drunk, chasing a homeless man with a bag of McDonald’s french fries, slapping the backs and heads of theater goers while screaming at cast members during the first act all while puffing away at what might have been clove cigarettes. From there the actor’s misadventures went into full overdrive when he attempted to evade arresting officers when he fell drunk flat on his face, proceeding to curse them, call one of them a ‘fag’ before being made to wear a spit mask after copiously spitting his heart away as he was led to overnight detention and released the following morning into the shiny gaze of the media after making his miserable appearance of a judge on charged of disorderly behavior and dysfunctional existence. Which would have had made it all perfect had it been part of a movie script except it wasn’t. Perhaps next time. via x17online: The 28-year-old actor was seen leaving his Hollywood Hills home for a private facility, where stars have sought help. 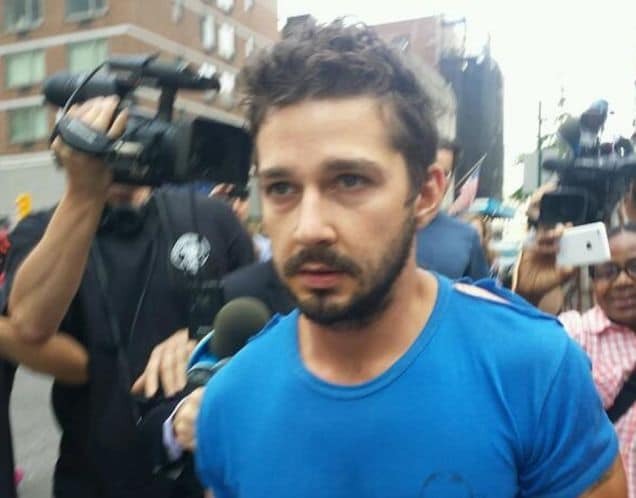 “Shia was nervous; he didn’t look good all morning. He was looking down and wasn’t even talking to his driver. It looked like he didn’t want to do it, but he knew he had to,” a photog from the agency shared. At present it’s not entirely understood if the idea to commit to rehab was the actor’s own idea or at the urging of handlers. Never mind Shia, you’ll get through this one. Or maybe you won’t…?